This article is about the type of Vs. match. For other uses of "Coin", see Coin (disambiguation). One Mario hits another in a Coin Battle, producing coins. Coin is a mode of Vs. Play in Super Smash Bros. Melee, Super Smash Bros. Brawl and Super Smash Bros. for Wii U. 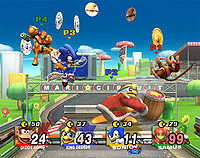 The objective is to collect as many Smash Coins - and, in Brawl and U, Smash Bills - as possible. Coin Battles are timed, and the player holding the most Smash Coins at the end of the match wins. Coin battles also take place in certain event matches, namely Spare Change, All MINE!, The Great Remodeling Battle, Four Swords Brawl, Jackpot Opportunity, A Royal Errand, and An Offering of Coins. A Coin Battle in Brawl. A Coin Battle in Melee. Coins are produced when any attack hits an opponent. The amount and value of the coins released depends on the strength of the attack. Smash coins thrown from a player will not be deducted from their tally, but being KO'd will cause the player to lose half their coins (to a maximum of 100 in Brawl and for Wii U). Several gold coins will also be launched from the blast zone, and may be grabbed if close enough to the stage. In Melee, there are gold, silver, and copper Smash Coins, worth ten, five, and one point respectively. In Brawl, the coins were lowered in value to six, three, and one point respectively, while a new item, the Smash Bill, is introduced. Bills flutter and fly erratically, making them difficult to pick up, but they are worth 10 points each. In for Wii U the Smash Bill is worth 6 points each. Should multiple fighters have an equal amount of coins when the announcer calls out "TIME! ", the match will go to Sudden Death, with the winner being the last fighter standing. Here, the coins earned won't apply in this situation. Every Co-op coin event match requires both players to stay alive. In for Wii U, Coin Battles cannot be played in 8-Player Smash. This page was last edited on March 26, 2019, at 03:46.